. إن الخدمات الممتازة وحسن الضيافة العالي في Caravella Backpackers تجعل إقامتك تجربة لا تنسى. تتضمن الميزات الرئيسية في هذا الفندق: خدمة غسيل ذاتية, تسجيل وصول/خروج سريع, تخزين الأمتعة, واي فاي في المناطق العامة, صف السيارات. في الفندق غرف نوم يتجاوز عددها ، كلها مجهزة بعناية وجمال وبعضها مزود بـ بياضات, مناشف, اتصال لاسلكي بالإنترنت, اتصال لاسلكي بشبكة الإنترنت (مجاني), غرف لغير المدخنين. سواء كنت من محبي الرياضة أو كنت تتطلع لتفريغ عناء نهار صعب، ستجد خدمات ذات مستوى عالي بانتظارك كمثل حمام سباحة خارجي, ملعب للأطفال, حديقة. يحظى فندق Caravella Backpackers بموقع ممتاز وخدمات يصعب منافستها. يجب على النزلاء إبراز بطاقة هوية شخصية وبطاقة ائتمان سارية عند تسجيل الوصول. يفتح مكتب الاستقبال من الساعة 07:00 صباحًا وحتى الساعة 08:00 مساءً. يرجى من النزلاء الذين يصلون خارج هذه الساعات إبلاغ مكان الإقامة بموعد الوصول المتوقع ورقم الرحلة وعنوان البريد الإلكتروني مسبقا. Nice surprise for Australia usual at this price. The room i was upgraded to is not too expensive per night anyway. I had own pvt bathroom and shower. It was nicely decorated and very clean. Only thing is i got back around 3 am and someone had left the gas cooker in the communal kitchen on full, could smell gas almost from my room. Very dangerous..signs could help or turn gas off after 10? No security personnel or even night watch and reception closed by 8pm. Employees are nice. There are public kitchen you can use. Had a lovely stay, great location close to the centre and lagoon. Staff were very helpful and could advise what was best to do in the area. They also helped me with booking a dive. Showers, kitchen were clean and plenty of space to socialise with lots of tables. I Would definitely stay again. The good....Sits right on the esplanade, has an indoor pool, great kitchen facilities and even has a fridge in the room. Not so good.... Stayed in a 6 bed female dorm and the bins only got cleared after day 4. Bathrooms smelled a bit damp, the room smelled like sweat and pee... (But I think this is cos the girls in my room were afraid of opening the window to ventilate it!) Everything else... Overall, a great place to meet others, staff were friendly and helpful. Good base and easy to find. Many of the tour operators know of it very well. Would recommend to others. 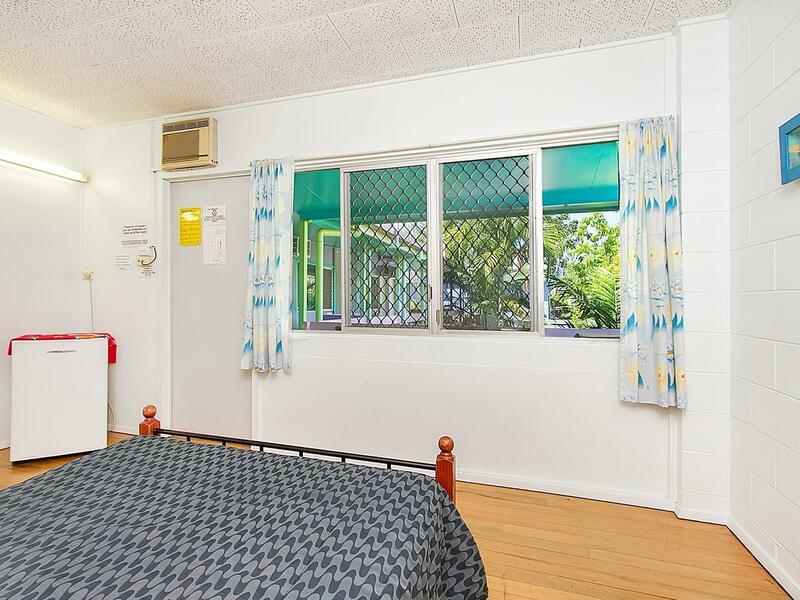 Excellent location, very close to CBD, and a few tour pickup points. Great swimming pool and friendly and helpful staff. But it lacks common resting area. There are two kitchens, but there's no lounge and not enough tables for people to sit and eat. The staff at caravella are really nice and helpful. a Taiwanese staff, has helped me and my friend a great deal in recommending and booking day tours, suggesting places to go and restaurants to dine in. Other staff are also very nice, just that if you prefer communicating in mandarin, a hearty staff would be of great help. The rooms are spacious and clean. 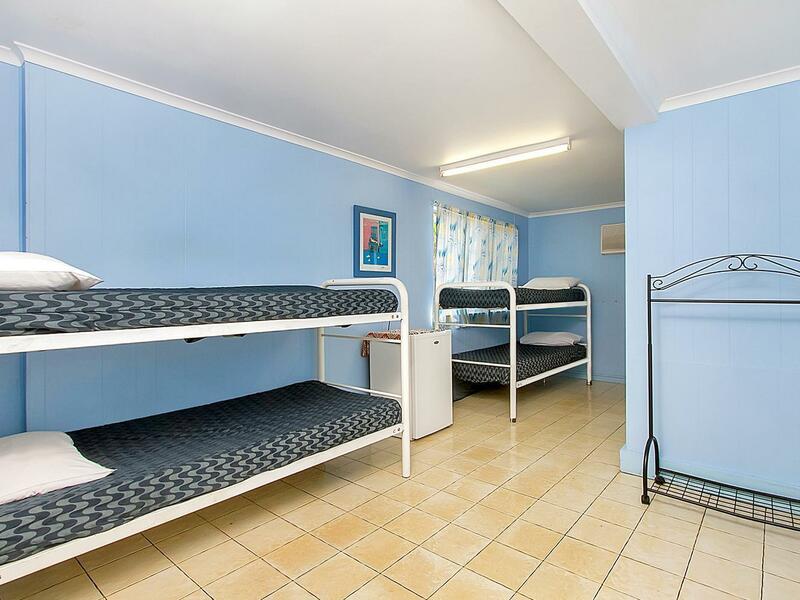 There is a spacious laundry area where you could dry your diving gear too (for those who would bring along your own stuff for diving at the great barrier reef). Caravella is located near the seaside, but it will be only a 10-15 min walk to the city centre for supermarket, central shopping centre etc. So you can enjoy the peacefulness and yet get in touch with all you need in short walking distance. Wifi is only available in common area, connection may not be very stable if many people gather around. 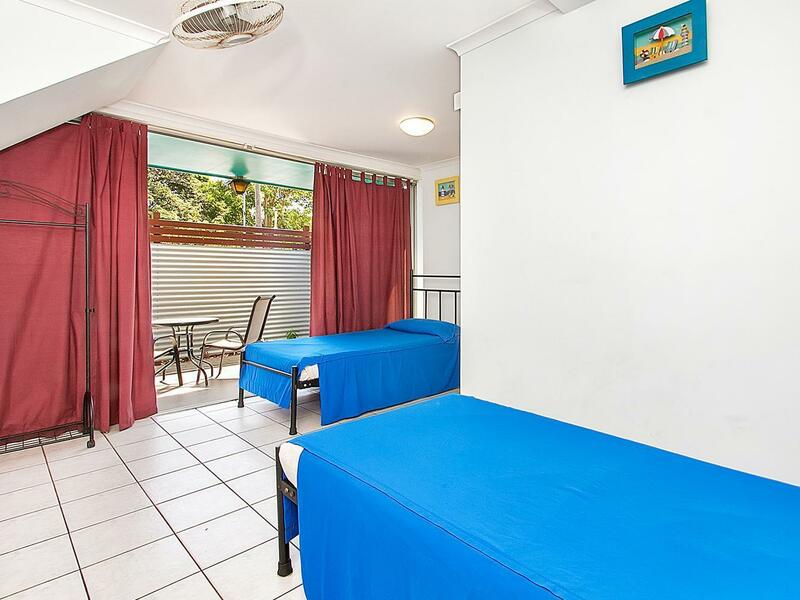 A great place to stay in Cairns, and will definitely stay there again for my future visits. We only stayed one night here but had no complaints at all. We arrived late and that was no problem for the staff. They were very helpful and had some great tips about what we could do from Cairns. I would definately come back. Caravella really left me a great first impression coz I arrived very late at night, but they left me a very considerate note, telling me how I could check in myself. Thanks guys~!! Plus, it's really close to everything and everywhere, so just go and try it! The Cairns esplanade just in front of the hostel. Within 15 mins walk to the city start from the esplanade. Room is clean but the bed ,pillow sheet is little bit dirty like some yellow stain... Air conditioning is old but it is cold enough for autumn not sure for summer. Overall is good , highly recommend for the traveler that having whole day activity. There are some public area like swimming pool and kitchen outside the room ,u can spend some time to chill. Wifi is not free after 10PM,u may purchase at front desk. Staffs is super friendly and helpful ! U can store your luggage if you check out early. Overall is good, if you are not a neat freak. 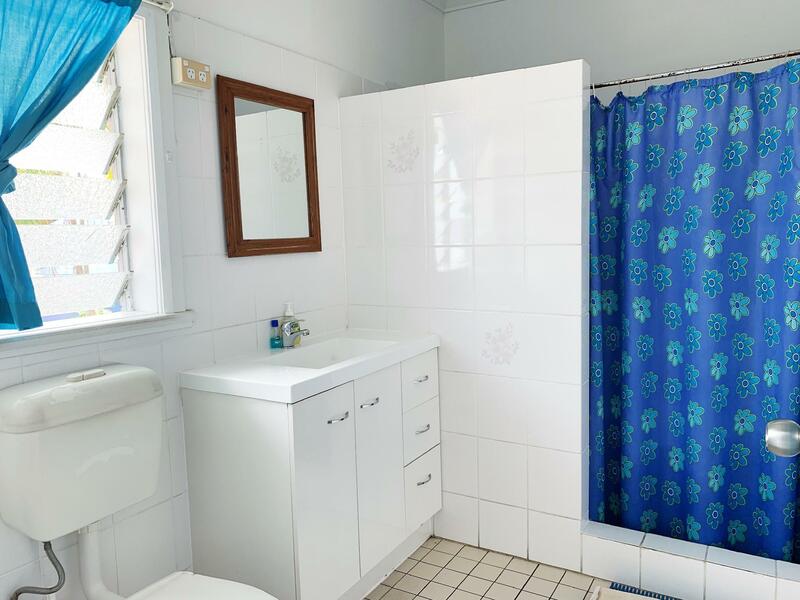 I had the single room with shared bathroom and it was fairly basic, not even a television, but it was very clean. About a 15 minute walk to the mall at Cairns. Value for money but the double room we stayed was not very clean. They have a big kitchen. And the WiFi is only in the common place, if you want in the bedroom, you have to pay it. They offer discount to do some activities (like great barrier reef). We stayed in a private double room with ensuite for two nights. The room whilst not large, suited our needs and provided all the facilities that we needed. 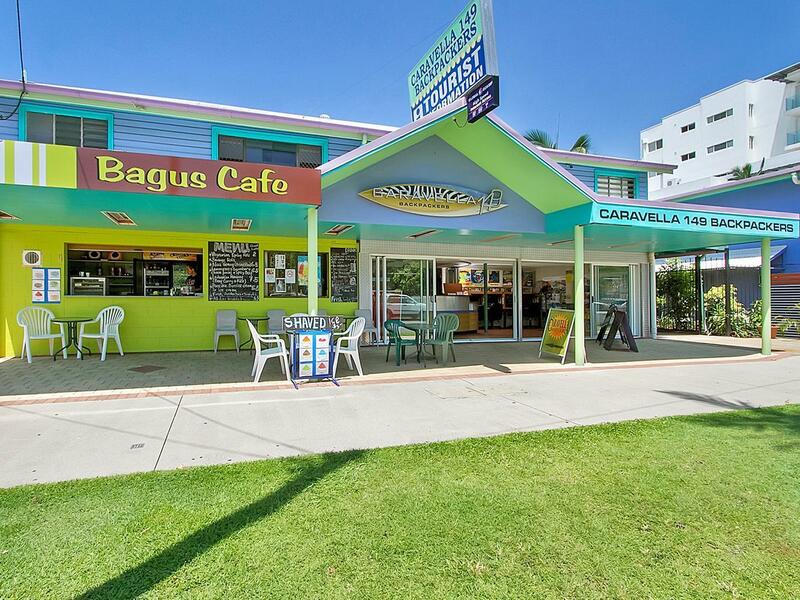 There are two large kitchen areas and a large outdoor seating area where backpackers may dine or chat with friends. 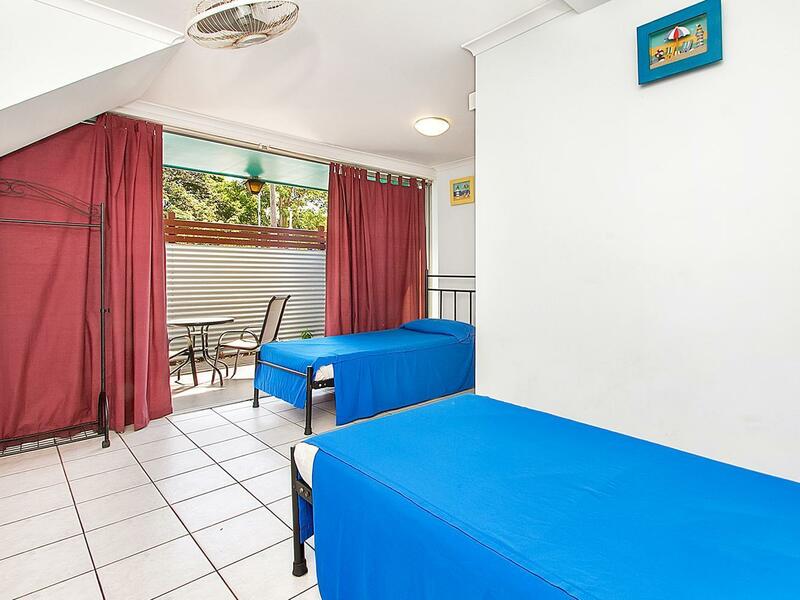 There's also a pool at the back and an Indonesian restaurant situated at the front of the hostel facing the street. Across the road from the hostel is a park and then the ocean. You can walk to Cairns Central Shopping Centre in 15 minutes. We enjoyed staying at this hostel. Its about a 10 or 15 minute walk to the main esplanade. Didnt enjoy it at first (travelling a long time was tired of walking) but ended up loving the walk. Such a gorgeous scene. My room has AC. Worked well. Bed seemed short to me, but was comfy. Private bathroom was nothing fancy, but I didn't have to wait in line so it was worth it. Was there during the rainy season, apparently super tiny ants like to crawl around. They dont bite. But I didn't like them. Staff was super helpful and friendly. Would stay here again in a heartbeat. The place is missing a few things to make it a comfy place to stay. Rooms are so basic, that it's hard to organise yourself. It only has a fridge. Beds were not very clean. Shower/toilet was run down, no places of hanging your stuff, so everything gets wet. The poolside is nice. The kitchen is somewhat clean. The outside area with the free wifi is nice to meet people, but the wifi is not on 24-hours. You have to buy wifi, which I think is not good.... and when you buy it it still doesn't cover all areas in this hostel (we received a refund).